Love, Mrs. Mommy: The Timeless Beauty of the Ariana Ost Collection! The Timeless Beauty of the Ariana Ost Collection! When looking through my closet and jewelry, I noticed something… all my favorite pieces are timeless classics. They can be worn for many occasions, and won’t fall out of style. I am always on the hunt for items that are unique and beautiful in fashion and I am excited to say that I have found that in Ariana Ost! An amazing designer brand, that has fit the bill ten-fold! Ariana Ost’s mission is to elevate the everyday and to celebrate life’s simple moments. Ariana studied abroad in Paris and London while attending Parsons School of Design in NYC. She was inspired by the old world handcrafted approach to fashion and has created a beautiful array of romantically aesthetic designs. And just think, all of this magnificence is handcrafted right in New York City! I had the absolute pleasure of receiving three items from her amazing collection and I am excited to share them with you! The Floral Back Halo is an absolutely stunning piece! With its ethereal flower and vine design it creates a romantic feel to any outfit. It reminds me of the Victorian days when women would dress up in their big and beautiful dresses and adorn their hair with their favorite hair accessories. Ariana Ost takes that vintage feel, but spins it with a modern flair. When I wore this out the other day I received a multitude of compliments! Be prepared to turn some heads with this beauty! This striking design is on a brass base and comes in both rose gold or gold-plated finish. The Liberty Print Necklace has a contemporary elegance that can be worn for a variety of occasions. 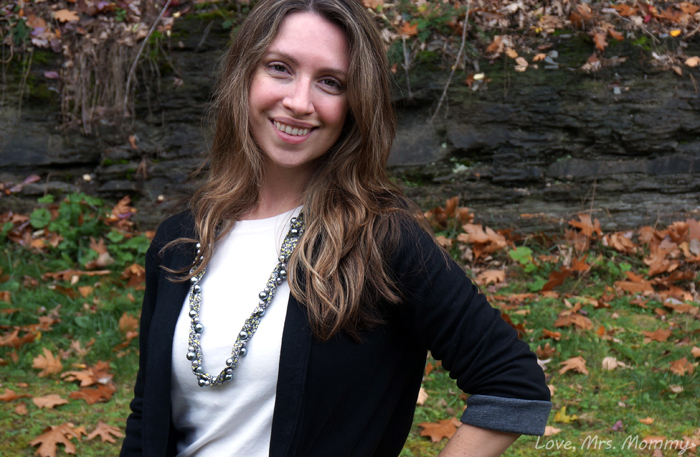 The necklace is adorned with graduated soft gray pearls that are woven through the fabric as the material twists and turns to make an eye-catching piece. The necklace is 50” in total length and the back has a ready-made bow, which can be adjusted for your perfect length. The perfect accessory to wear with pretty much anything! I loved pairing it with a smart little black jacket and a classic T.
The Aurelie Baby Headband, which is lovingly named after Ariana’s daughter, comes in a beautiful array of colors. We received Metallic Rose, but with so many to choose from, you are going to want them all for your little sweetie! This headband has been hand cut and crafted in metallic leather and has an elastic band which makes it oh-so-easy to get a perfect fit. The piece de resistance is the dip-dyed silk bow, which is absolutely gorgeous, and gives the piece an extra sweet touch. 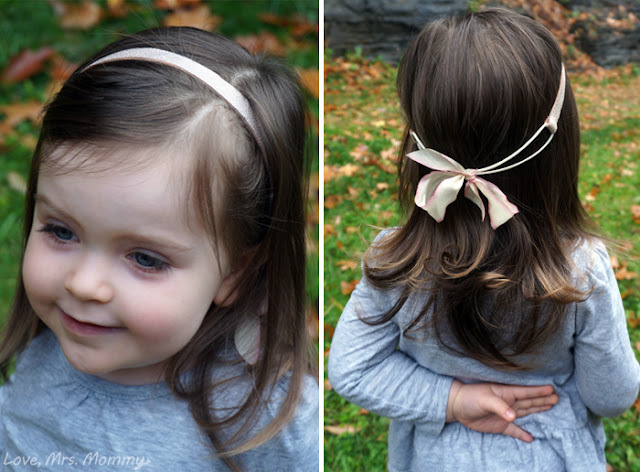 When my little one is playing, I have witnessed many a hair accessory fall out of place, turn over, or just plain old fall off. With this hair band, you won’t have to worry about adjusting it, no matter which way it moves, it looks adorable! The “top” can be the “bottom” and vice-a-versa. Made with versatility in mind and that’s absolutely lovely! With the beauty and attention to detail Ariana Ost is crafting in her array of home to fashion pieces, she is accomplishing her goal of elevating the everyday and creating modern heirlooms. 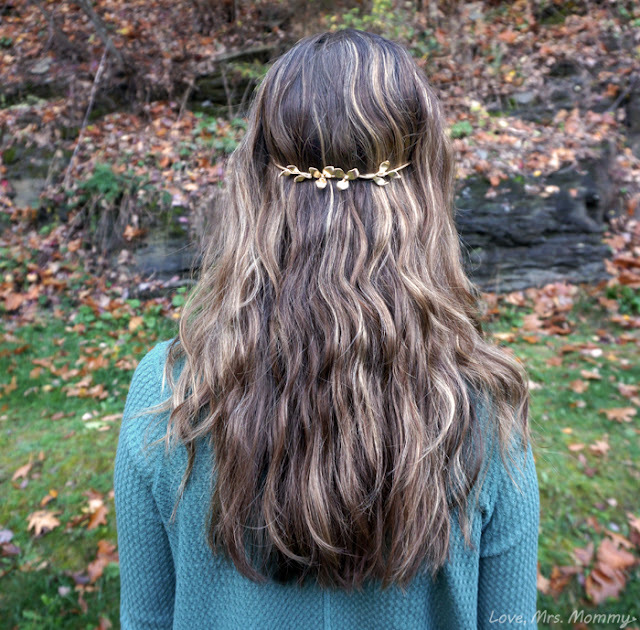 Taking something as typically simple as a hair accessory and turning it into something of elegance and beauty, has certainly caught my eye and my daughter’s too! She loves her hair band and has even worn my necklace a number of times. Even for such a young little sprout, my little lady has quite the exquisite taste! Connect: Find out more about Ariana Ost by visiting her website. Then make sure you “like” her on Facebook and follow her on Twitter. Buy It: Click here to purchase the Floral Back Halo, Liberty Print Necklace, and Aurelie Baby Headband featured in this review. Don’t forget to check out all the other beautiful pieces she carries, you can do so here. I love these pieces! I just love to accessorize so bling me up Scotty!! Oh my!! They are gorgeous!! I adore that hair piece!! Really stunning! I love hair accessories! I have long, curly hair so these would definitely stand out. Such beautiful accessories! I must have some of these! I love all the pieces. I want them all. I love that the baby headband comes in different colors. It looks great!